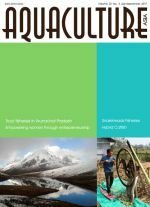 Regional network on culture-based fisheries and stock enhancement; trout fisheries in the uplands of Arunachal Pradesh - resources and opportunities; empowering young Indian women through entrepreneurship development - opportunities and constraints; a view on murrel (snakehead) fisheries in India; hybrid catfish Clarias batrachus x Heteropneustes fossilis produced by farmers in West Bengal, India; Backyard fish based pig farming using low-cost feed in Arunachal Pradesh - a success story; NACA Newsletter. Apple snails have become a major pest of wetland rice in much of Southeast Asia. Two species are involved, Pomacea canaliculata and P. maculata. One or both of these species have become widely established not only in many parts of Southeast Asia but also in other parts of the world. 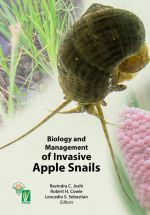 This book provides an update on research into the biology, management and use of apple snails and highlights the need to prevent further spread of these species. The fourth major international event on giant freshwater prawns was organised by the Asian Institute of Technology from 20-24 March 2007. The conference, organised by Salin Krishna and Michael New, built on a series of highly successful events that trace back to the very beginnings of the industry. The first conference, Giant Prawn 1980 brought together all those involved in freshwater prawn research and farming for the first time and set many priorities for future research and development. 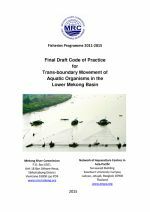 This Code of Practice is prepared to promote or ensure compliance to World Trade Organisation-Sanitary and Phytosanitary measures for the movement of live aquatic organisms in the Lower Mekong Basin. The goals of the Code are to achieve environmental protection and management, biodiversity conservation as well as prevention of spread of disease epizootics. Most of the points listed in this Code are based on the inputs of MRC Member Countries. 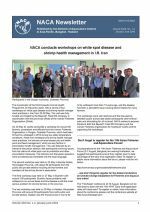 NACA conducts workshops on white spot disease and shrimp health management in I.R. Iran. Don’t forget to register for the 11th Asian Fisheries and Aquaculture Forum! NACA pays tribute to Professor H.P.C. Shetty – Patron of the Pillay Aquaculture Foundation. EHP: Shrimp industry survey. 3rd International Conference on Fisheries and Aquaculture, 24-25 August, Negombo, Sri Lanka. Special Session on the Status of Aquatic Genetic Resources for Food and Agriculture. Second International Technical Workshop on Acute Hepatopancreatic Necrosis Disease (AHPND). 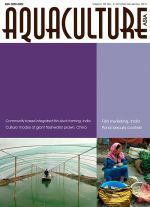 Guidebook on Farmer-to-Farmer Extension Approach for Small-Scale Freshwater Aquaculture. 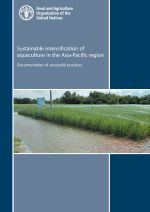 Sustainable intensification of aquaculture in the Asia-Pacific region. Changes to the magazine and website. Status of alien fish species farming and it's implications for Andhra Pradesh, India. Bridging the research-extension-farmer-input and market linkage gap in coastal aquaculture through application of ICT. 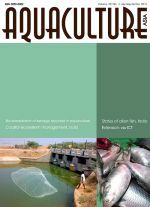 Bio-remediation of domestic sewerage recycled in aquaculture: A Central Institute of Freshwater Aquaculture model. Role of family farming in marine and coastal ecosystem management in India. Conservation of fish genetic resources: An introduction to the state fishes of India.